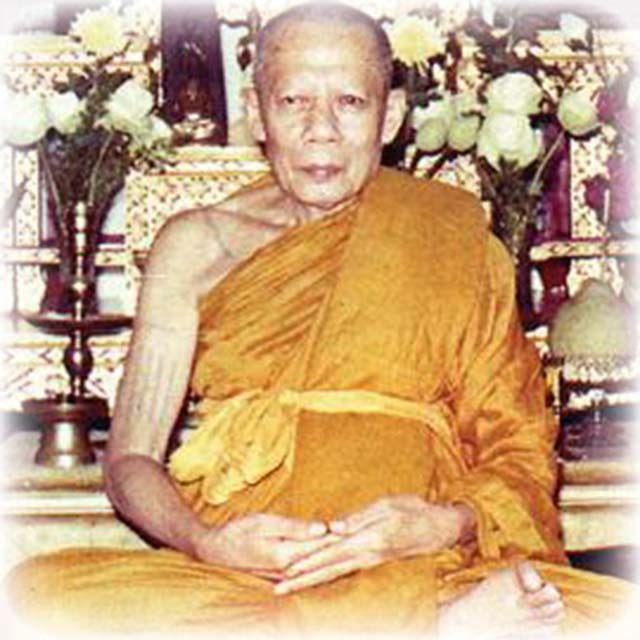 Luang Phu Lampoo was Vice Abbot of Wat Bang Khun Prohm temple, and was born in 2444 in Amphoe Ta Ruea, Nakorn Sri Ayuttaya. He was Ordained at Wat Gai Jan in Ayuttaya, in the Year 2465 BE on the 1st of May, which was a Monday (Moon day) of the 6th Lunar Phase of the 6th Lunar Month. His Upachaya was Pra Ajarn Luang Por Badtr Intachodti of Wat Sadteru, of Ayuttaya. 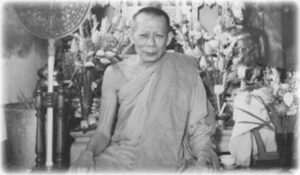 His Gamma Wajajarn was Pra Atigarn Luean of Wat Thalung Hlek, and his Anusawri Ajarn was Pra Ajarn Tong Dee of Wat Bua Nam in Ayuttaya. Luang Phu then diligently studied Khom Agkhara Ancient Sanskrit Magical Script. In the year 2469 BE Luang Phu Lampoo moved to practice further at Wat Chang Tong in Ayuttaya, where he spent 7 years practicing Kammathana Vipassana. During these years, he studied Khom Sanskrit Agkhara and Putakom Sorcery. In 2473 BE he reached his Batchelor’s Degree which he passed at Wat Nong Khuean Kang in Sra Buri. Then, in the year 2477 BE Luang Phu moved from Wat Chang Tong to stay at Wat Bang Khun Prohm in Bangkok to continue his practices, and was elected to become Vice Abbot the first time in 2502 BE, which Luang Phu refused, saying they should choose a younger Monk. In the Year 2512 However, Luang Phu Lampoo was given the task of Vice Abbot, and accepted. Luang Phu Lampoo was one of the members of the Gammagarn Comittee who performed the official opening of the Chedi Yai Gru Chamber in 2500 BE to remove the Pra Somdej Wat Bang Khun Prohm amulets of Somdej Pra Puttajarn (Dto) Prohmrangsri (Wat Rakang Kositaram). After most of the amulets were distributed, those which were broken and left over, were taken by Luang Phu Lampoo and kept in his Kuti hut. 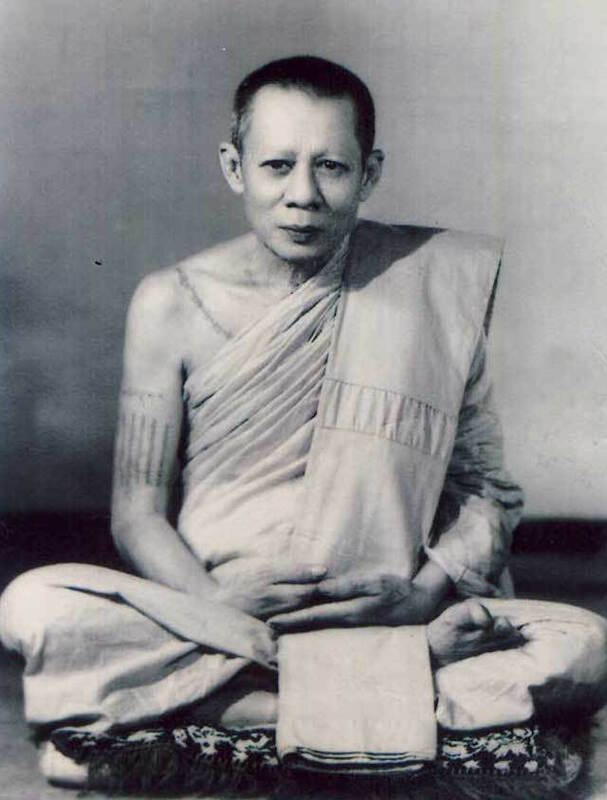 As the unbroken amulets were all depleted, and the devotees found out that Luang Phu Lampoo had kept a large number of the broken ones at his Kuti, the devotees began to flock to him to ask for hims to give them a broken amulet. Luang Phu then decided to grind the broken amulets of Somdej Pra Puttajarn (Dto) Prohmrangsri into powders again, and repress them into newly formed Pra Somdej. He mixed the sacred amulets which were ground down with some other Muan Sarn Sacred Powders which were gathered from the most magical and sacred sources, temples and masters, and repressed the powders into amulets again within the Dtamra Pra Somdej of Somdej Pra Puttajarn (Dto) Prohmrangsri Wat Rakang Kositaram. There were both light colored amulets, and some were also mixed with black Pong Bailan powders (made from burning ancient Buddhist parchment magical grimoires into soot). 1. Pim Yai 2. Pim Yai Gaes Talu Sum 3. Pim Yai Dtor 4. Pim Ok Krut 5. Pim Sen Dai 6. Pim Thaan Koo 7. Pim Thaan Saem 8. Pim Prok Po 9. Pim Kanaen 10. Pim Jantr Loi and 11. Pim Saiyasana. As to the 11th Pim (Sayasana sleeping Buddha), only very very few of this model were made, which Luang Phu distributed himself handing out to his closest devotees at the temple. Luang Phu Lampoo finished the amulets in 2502 BE, and began to distribute them. He also took a number of the amulets and hid them back in the Chedi Stupa Gru chamber until the year 2519 BE. Thereafter, they were removed and handed out to devotees who came to receive Holy Water Blessing to heal illnesses, which was performed at the temple in that year by Luang Phu Lampoo. 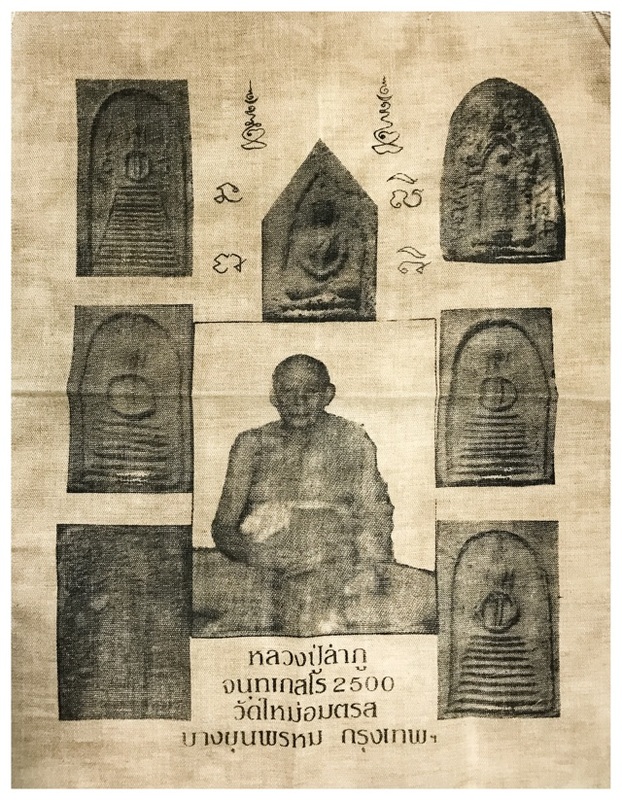 Apart from the Pra Somdej Wat Bang Khun Prohm 2502 famous Pra Niyom amulet edition, Luang Phu Lampoo also created many other editions of preferred amulets, including the Pra Somdej 2514 BE Hlang Yant edition, 2515, 2516, 2517 and 2519 Editions. Luang Phu Lampoo also has famous Guru Monk Coin edition amulet, which has a first and second edition, known as the Rian Roop Khai (oval egg shaped coin), and the Rian Met Dtaeng (Watermelon Seed shaped small coin). The coin featured the image of Luang Phu Lampoo sitting in meditation (Samadhi). The blessing of those amulets was made in is Kuti with a number of Great Monks he was befriended with, in the Year 2515 BE. After this Luang Phu Lampoo made and released his 2516 BE and 2517 BE Pra Somdej Wat Bang Khun Prohm, which were blessed in Buddha Abhiseka at Wat Gai Jan, the temple of is original Ordination into the Sangha, where they were also released. The remaining amulets left over were re-hidden within the Chedi Stupa at Wat Bang Khun Prohm, until the Year 2519 BE. In 2519 BE, the Chedi Stupa was reopened and the amulets from all of his editions till then were removed and re-entered distribution, with certain models being stamped with rubber ink stamps for differentiation from the original releases in 2502, 2514, 2515, 2516 and 2517 Chedi Openings. Their Majesties installed the Buddha Relic within the Pra Gaes Mala topknot of the Buddha Image, and signed the Sila Reuks foundation stone and Invited the Buddha to dwell within the Image. Their Majesties also planted 2 Pikul Trees (Asian Bulletwood – Latin; Mimusops Elengi), and donated a large donation of funds to the temple of Wat Gai Jan.
Luang Phu Lampoo is also known to have created Pra Somdej amulets at Wat Gai Jan Temple too, in the years 2521, and 2522 BE, making only one single Pim Model, the Pra Somdej Pim Yai. 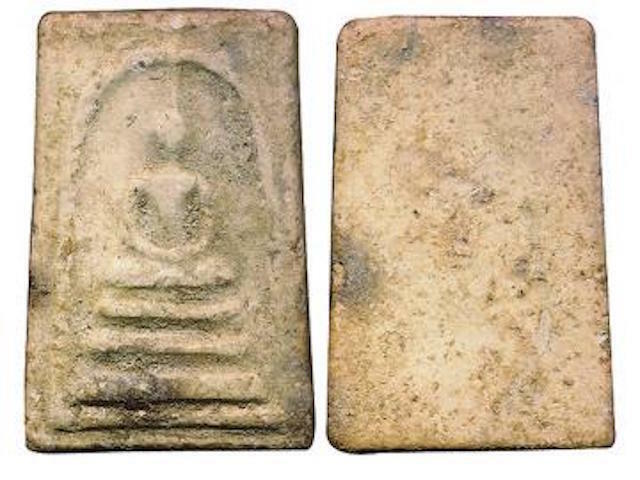 Many amulets of Luang Phu Lampoo were also secretly hidden under the base of the Pra Pratan Buddha Image at Wat Gai Jan, and in the Year 2542 BE they were removed for distribution. 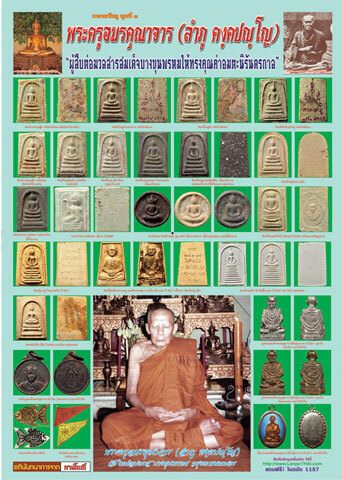 Luang Phu also made some Guru Monk Coins in 2524, which celebrated his 80th Year of Age, and in the same edition, Wat Gai jan also created a Bucha statue in his image to pay respect to Luang Phu Lampoo. This is considered to be Luang Phu Lampoo’s last ever edition. He did not make any Pra Somdej amulets in that edition at all. 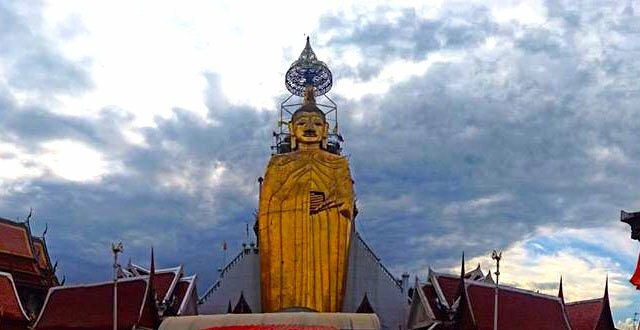 Luang Phu Built a Vihara srhine at Wat Gai Jan for his body to be kept at after his death, but remained at Wat Bang Khun Prohm until his death, leaving instructions for his body to be moved to Wat Gai Jan after one year of his passing. On the 1st September 2533, Luang Phu Lampoo finally passed away, and after one year of respect giving at Wat Bang Khun Prohm, his remains were moved as instructed to Wat Gai Jan, and installed in the Vihara Shrine which he had allocated for himself to be placed in. Luang Phu Lampoos body did not decay in any way over the years as they have passed, but In the Year 2552 BE, the committee of Devotees of Luang Phu Lampoo began to rumour about the need to perform a Royal Decree Cremation for the remains of Luang Phu Lampoo according to Tradition. Luang Phu Lampoos remains were finally cremated on 14th November 2552 BE at 16:00 hours.